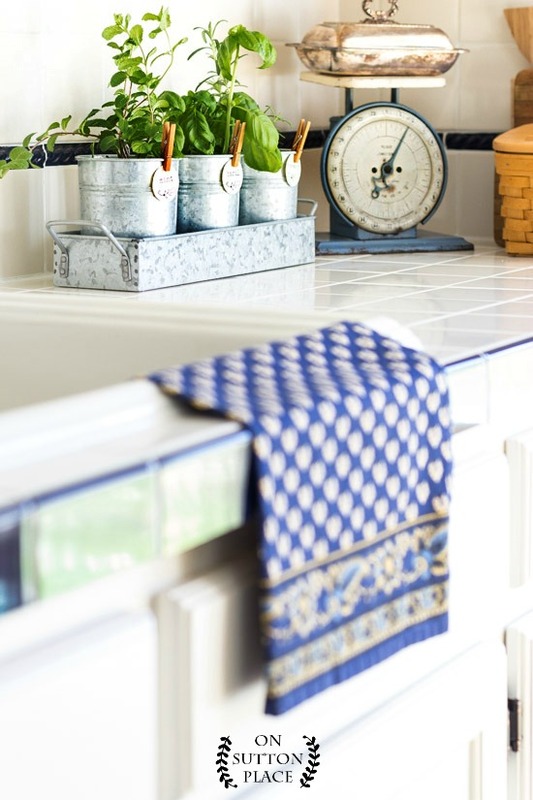 Put this farmhouse style kitchen herb garden together in minutes! 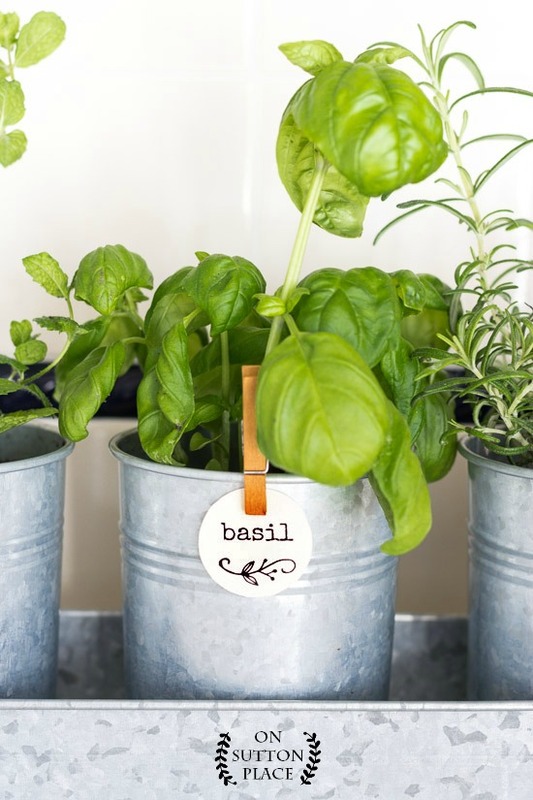 Includes free printable herb garden tags. About this time every year, I get the itch to work outside. To get my hands dirty. To clean up my garden beds. To figure out if any plants need replaced and dream about the new ones I want to try. The problem is that here in Ohio, it’s just a bit too early for any of that. So, like last year, I planted an indoor kitchen herb garden and thoroughly enjoyed getting my fingers in the dirt. I was planning to go to a local nursery or Lowe’s, but was able to find beautiful herb plants at my grocery store in the produce section. It took about five minutes to transfer the herbs from their plastic pots to the metal buckets. I was planning on putting small rocks in the bottom of the buckets to allow for drainage, but I lucked out. There was one perfect hole already drilled in the bottom of the buckets. If I happen to over-water just a bit, the water will drain right into the little tray. No herb garden is complete without plant markers. I shared some last year with my Indoor Mason Jar Herb Garden so I just printed off another sheet. Clipping them to the buckets with clothespins was the finishing touch. Click for the Printable Herb Garden Markers. 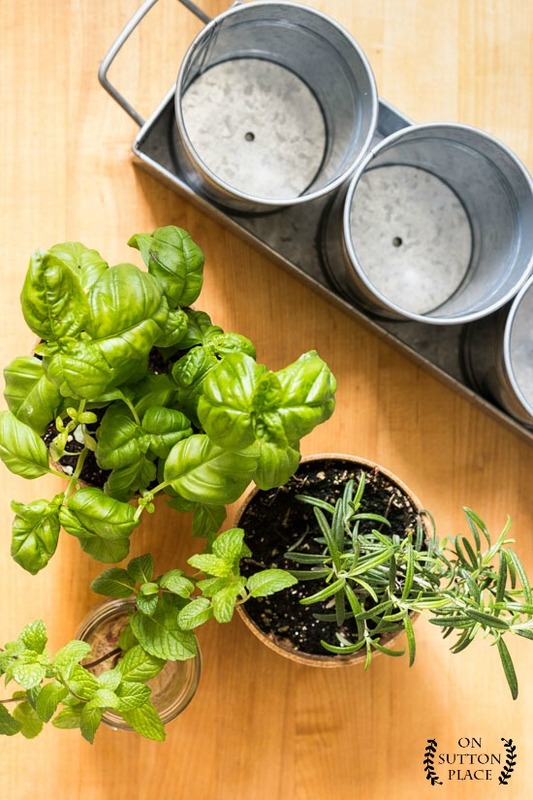 A kitchen herb garden is a way to hurry spring along and add some fresh greenery to your counter top or windowsill. You don’t need metal buckets either. Any containers will work. Mason jars, terra cotta pots, large coffee mugs, lined wicker baskets or small coffee cans. Just make sure to add rocks for drainage if your container doesn’t have a hole in the bottom. by and hanging out with me! I just went out yesterday and bought a small container garden for herbs! This is new for me, so please wish me the best, that I can keep them alive! I, too, am soooo ready for spring! Happy Birthday! I trust you had a very blessed day! I bought an AeroGarden and I love it. Of course, there are many different ways of getting grow lights from a simple bulb to a very elaborate system. The garden is a six-pod unit and I planted basil, thyme and parsley in three and then put salad greens seeds in the other three spots. Since there seems to be lots of recalls on lettuce these days, it is very nice to be able to harvest fresh greens and not even have to wash them off. I’ve started other glass containers of greens and I use the same method of watching the water be absorbed and stop when water hits the pebbles. I can see roots growing down into the pebble area. I also bought a tray of 5 herb pots to go on the window sill – I’m just waiting for the local stores to get their herbs in for the season. A benefit of having the grow lights in the kitchen is that I am feeling better – maybe it is all the fresh green growing or the impact of the lights during the overcast winter days. I am so doing this AND I plan on giving it as a birthday gift later this spring, so cute. Thanks for the tags!! What paper did you print your labels off on and do you just cut the circles out? Hi Danielle! I used regular card stock and yes, just cut out the circles. Have fun! I tried the green mason jar herb garden with smooth glass marbles in the bottom of each jar. Every one of the herbs died except the chives which I dug from my garden. Another plant an Aloe survived. I had mold grow on the potting soil in each jar. I took the basket and all to the greenhouse where I purchased the herbs and was told there was no drainage, I needed a drainage hole in the bottom of each jar. I was quite disappointed as I located a 6 place heavy wire basket to carry the jars. I am not sure I want to try to drill a hole in the jar. I’m sorry! I did not have this problem at all. I kept my jars in a sunny window so they dried out rather quickly. When I watered, I watched the pebbles. When the water hit the top of the pebbles, I stopped. The only reason mold would grow is if they were too wet. I hope this helps. I think because it is an inside garden I could plant them now. I will be posting this as soon as I get it together. Thank you for the little herb markers – they are so sweet. I am thoroughly enjoying this idea! I’ m out to buy plants and planters. I just wanted to let you know that I clicked on your link for the galvanized metal plant container and purchased it. It works perfectly! I love it! Just the right size and I also used your herb labels; too cute. Thank you as this post was so helpful. 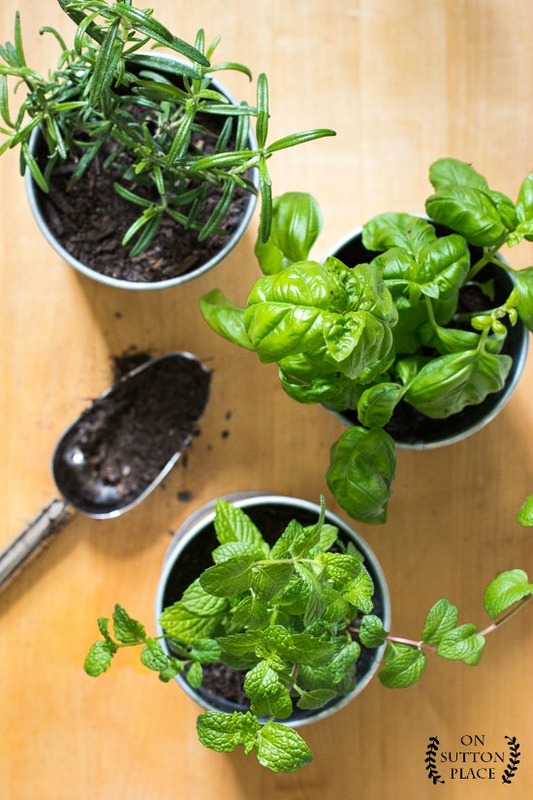 I’m ready to plant an inside herb garden ..
Great Idea :) think I’ll plant some very soon! Love… thank you for sharing! Truly inspiring! Good afternoon Ann, I love your kitchen herb garden as it will look so nice placed on a kitchen windowsill. 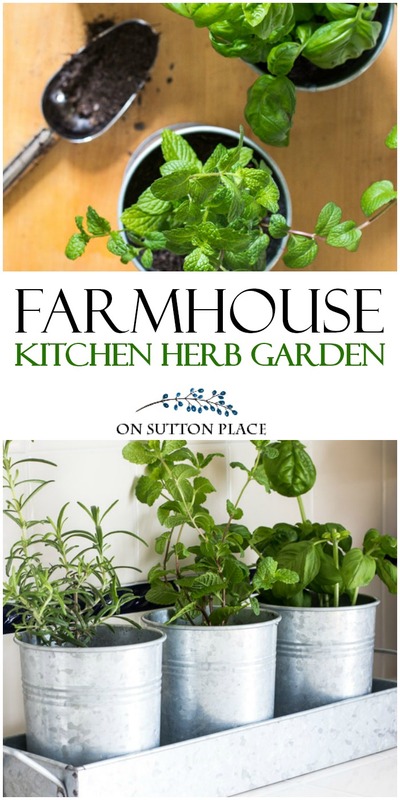 I use a lot of herbs when I am cooking so this herb garden will be perfect for me. I have spent the afternoon pruning my roses as we had some lovely sunshine today. I can’t wait for spring to finally arrive. There are some shoots peeking through the soil, so hopefully we won’t have to wait too long. Ann — what a great idea. It’s still a bit too wet here today in the Pacific Northwest for me to want to get out to my garden but I CAN plant some herbs! Love the signs and ideas. Thanks for the inspiration! I want to add this to my kitchen! Hi Ann. I live in canada and maybe you’ve heard how crazy the winters are here. Anyway when you talk about herbs to plant, can i start with seeds or i should get a full blown herb already? I have not tried growing anything indoors but this post has inspired me to try it. Thanks. Hi Angelica…for instant gratification I would recommend using plants. You would have to wait quite a while to be able to actually harvest any herbs if you started from seed. When the weather warms you can transplant your kitchen garden to bigger pots and put them outside. Hope this helps! Hi Ann. 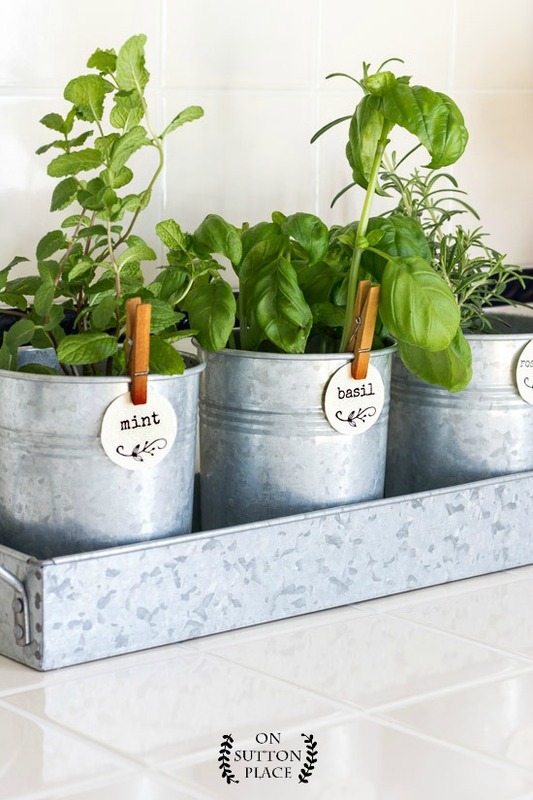 What a great and adorable idea for a fresh herb garden in your kitchen. Love it and all your recipes, hints, and ideas. Look forward to every single email you send. Thank you so much! This a great way t get my planting fix in early! And I enjoyed getting a little glimpse of your pretty kitchen! I just ordered the galvanized set and will plant herbs. Thanks so much for the blog. Love your ideas. 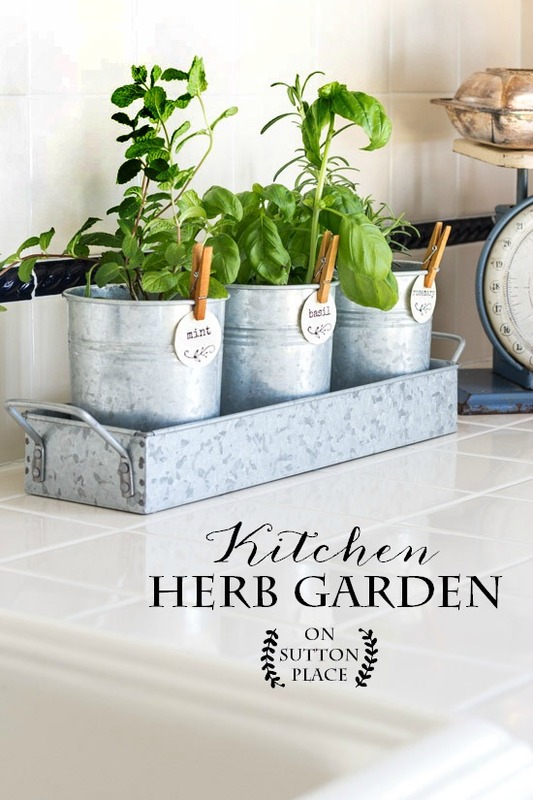 Your kitchen herb garden is adorable! I just bought some cute little plant markers in the dollar section of Target! I really didn’t know what I was going to do with them since my HOA doesn’t allow vegetable gardens. Now these will be perfect for my own kitchen herb garden. Thanks for the inspiration, Ann! Also, I wonder if you could help me with my daylilies. I live on the East coast of Floride. The weather has been wonderful for working in the yard. I remembered in a prior post, yours were so gorgeous! I have 5 of then. Three look awesome, but two look sick. They are blooming but they don’t have much foliage. Have any suggestions? Thanks Ann! Love this idea. I live in Ohio, too, and am getting impatient for spring. I’m going to order these planters and plant some herbs in my kitchen. It is hard to find good fresh herbs in the grocery store. Thanks for the idea. Great timing on this post. I’m ready for fresh herbs too! That cute metal tray/ pots is perfect! I just placed my order???? Your little herb garden reminds me of the hope of things to come. I thoroughly enjoy planting an herb garden each year, and I absolutely love harvesting, using, and sharing. I plan to get mine started soon! You have such practical ideas. I love the genuine simplistic beauty of your blog. Thanks, Ann. I have wanted fresh herbs for two years now. So happy to see this. We are having such crazy weather here in Cleveland, Ohio that this is what I will be doing. What a treat. Ann, I am such a fan of yours! I have downloaded, printed, ready, created as well as purchased on your ETSY site. When thinking of organization, this is IT! Thank you! I feel honored to be able to have access to your creativeness! Your creativeness lives in my home! For this, I am so appreciative! Mass and Storm Stella is arriving Tuesday along with a N’easter. Ugh! so ready for spring! So simple and practical, yet so pretty! I too yearn to get “the itch to work outside and get my hands dirty”! Love your idea and everything can be transplanted outside when it gets warmer. Love it Ann. It may be cold there, but it is rainy and cold here in Mississippi. What happened to spring weather? My son said it was cooler today than it was at Christmas. We are getting a bit of snow in NC this morning, so too cold for outside gardening here as well. I just ordered the the little pots/tray, they’ll arrive Tuesday!! I couldn’t believe how inexpensive it was! Anyway, it will give me time to get the little herbs that I need. Thank you for sharing this idea, gardening in the winter is always a treat for me. Love the new link to members only downloads! I have been wanting to do a little indoor garden ~ just for herbs. Just ordered the containers and downloaded the tags. As always, your posts are so simple and elegant. I look so forward to them. Looks great! Love the towel on your sink too! !